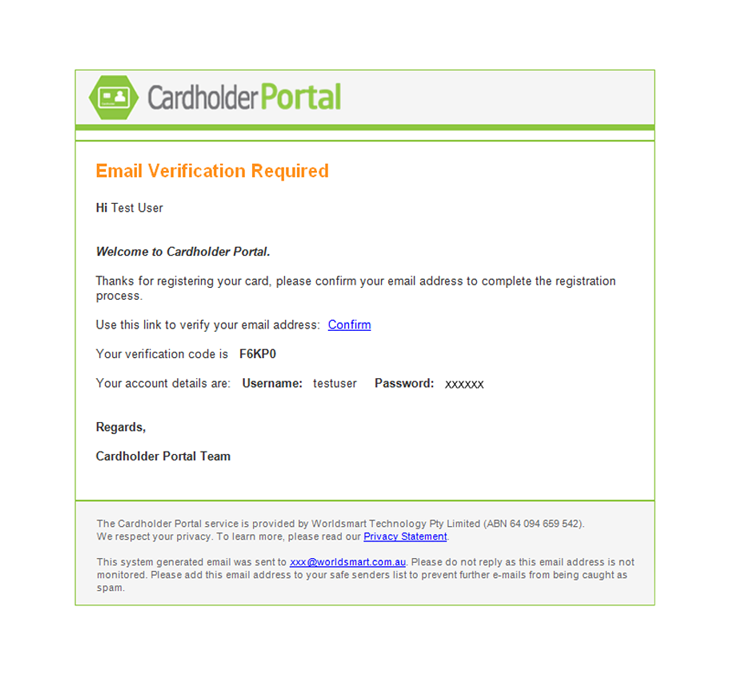 If you registered with email, you will receive an email from noreply@cardholder.com.au with a verification code (e.g. A1CE) included. We use this code to verify that the email address you provide is valid. If you could not find it in your inbox, please check your spam folder of mail server. Your registration is not complete until you have completed the verification process. Why do we verify your contact information? In order to protect the privacy of your e-mail address we send an email with a verification code in the message. We will require you to provide that verification code back to us (either click the link or enter it next time your log in to the portal) to complete the registration. This is to ensure that you are the authorised user of that email address and to also ensure that someone doesn't use your e-mail without your consent. We realise some people don't have a mobile phone, but don't worry, you can still register. If you don't have a mobile phone, you must provide a home phone number.